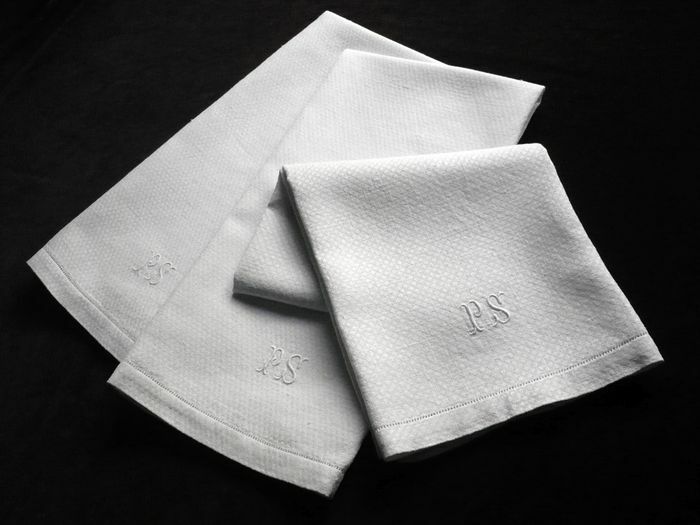 An elegant set of three pure white guest hand towels monogrammed "PS." This refined set of towels is loomed of a pure white linen/cotton blend damask with a motif that's known in French as "oeil de perdrix," or eye of the partridge due to it's diamond shaped pattern. These towels are ample in size, of excellent quality, and finished at either extremity with a classic hemstitch. Likely dating from the mid 20th century these towels are in impeccable condition. (Three additional sets of identical towels are available, for a total of eleven towels.) Dimensions: 36 x 26.5in.